When I lived in Calgary (2009-2012) I had to make some adjustments to my lifestyle: long commutes, long underwear, and longing for garlic fingers! 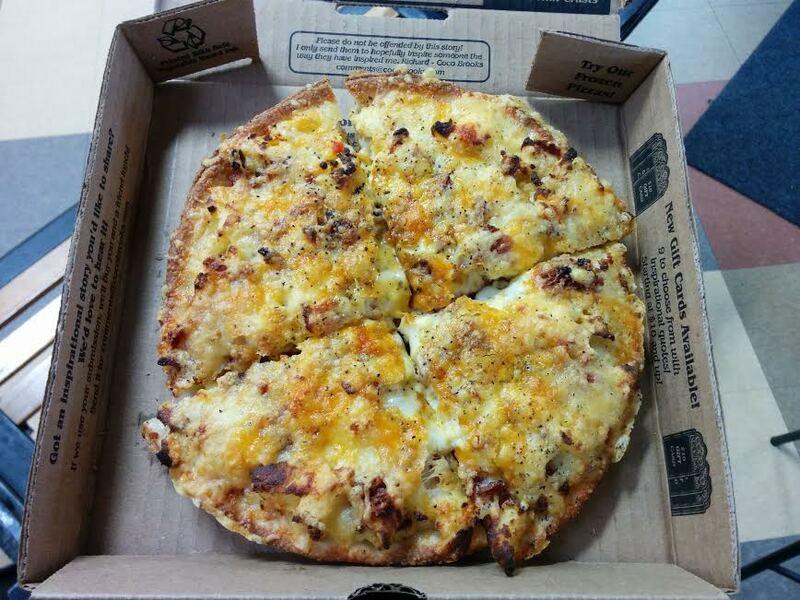 I learned that pizza shops make pizza – not poutine, nachos, burgers or fish ‘n chips. I learned that shrimp goes on pizza and that ranch dressing goes on everything. I also discovered that many of the good Calgary pizza shops close at 10pm while the liquor stores are open until 2am. Oh, the injustice of it all! Most importantly, I learned to love Calgary’s Greek-style pizza (which I’ve written about at length) and now I crave it every time I visit. I’ve been back to Calgary several times since living there and I’ve had lots of time to re-examine the pizza scene, from Greek to gourmet. There’s also been lots of new pizzerias popping up! What’s cool about Calgary is all the different styles of pizza that you can find there now. It’s a city that attracts people (and pizza styles!) from all over Canada. Here’s the culmination of my Calgary pizza adventures! Pizza 73 is the largest pizza chain in Alberta with 89 locations throughout western Canada. They are operated by Pizza Pizza and the quality is about the same. It’s pretty damn baseline. 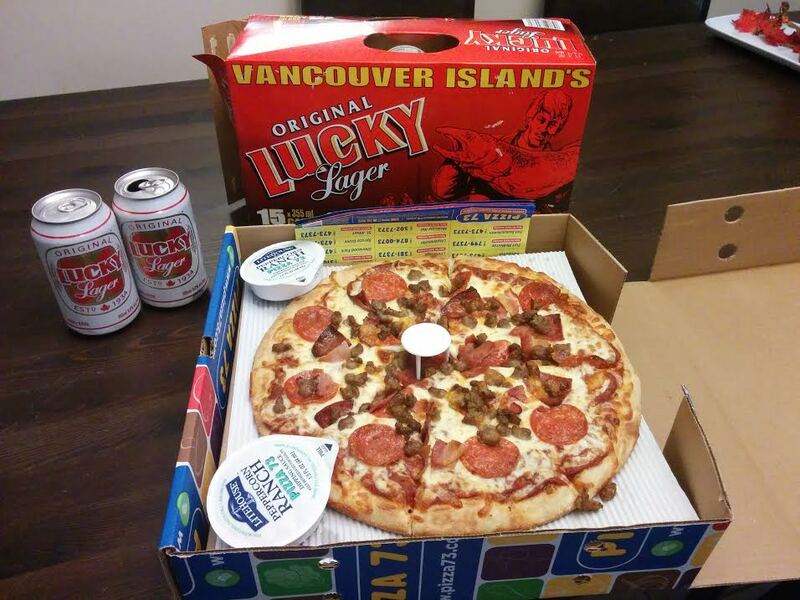 I can’t tell you how many nights we’d all be broke enough to go splits on a 15 pack of Lucky Lager and a double decker box with a medium pizza and feast of chicken wings, curly fries and veggies. This is what I call the “Poor Man’s Special”. It’s entirely, basically edible! Don’t forget the Ranch dressing! This is not Chicago Deep Dish Pizza. I repeat: THIS IS NOT CHICAGO DEEP DISH! All over Calgary. But there are bootleg versions. An industrial park or high school food court near you! This fast service restaurant sells personal sized pizzas in “inspirational story” boxes that read like church pamphlets. It was kind of a surreal experience for me, with the cafeteria-style seating and the God-loves-you vibe. The pizzas are pre-assembled and baked-to-order, so you won’t find any pizza snobs here. But it’s decent enough for a quick lunch under $10. Your neighbourhood “Pizza & Steak House” or “Pizza & Sports Bar”. mushroom, green peppers, tomatoes and onion. Bam! Some favourites: Atlas, Bonasera, Michael’s, Spiros, Inglewood, Jeanne’s, Manies. Saskatchewan-style is the thickest and meatiest of them all, with its mountainous piles of questionable deli meats! For the true Regina-style, see Houston Pizza. Calgarians have to settle for Saskatoon-based Vern’s. We ordered this on a trip last summer, crowding around the box to ogle the gluttonous mess before us. Alas, I’d rather have a regular Calgary pizza or head to Regina for the real thing. There’s one in each quadrant (two in the SE – Acadia, Ogden). 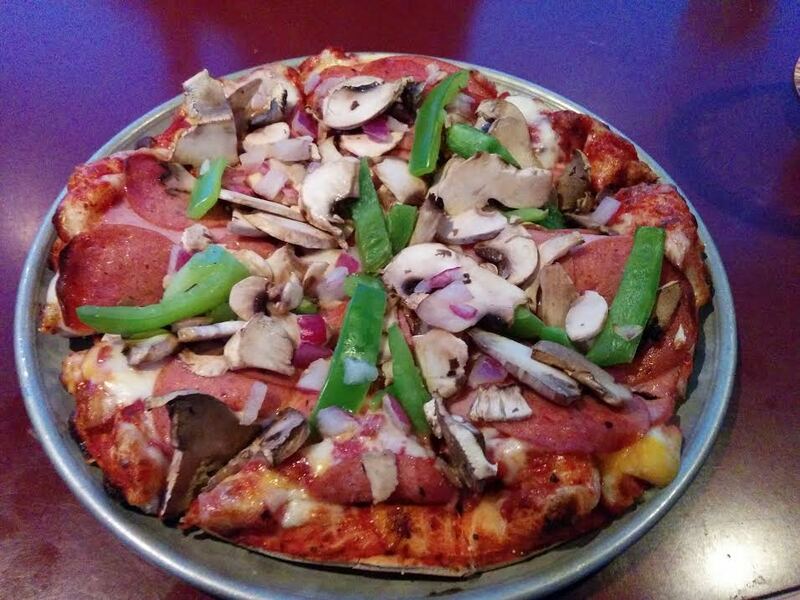 Gondola Pizza is a beloved Winnipeg chain, serving thin, square-cut pizza in an almost midwestern tavern-style. Here’s a picture. I used to order from Gondola when I was craving a thinner crust. I had no idea, at the time, that it hailed from the Winter City. A co-worker revealed this to me recently as I grilled her about iconic Manitoban foods, while she gushed over Imperial cookies, fat boys and honey dill sauce. Tom’s House of Pizza is one of the oldest pizzerias in Calgary (1963). 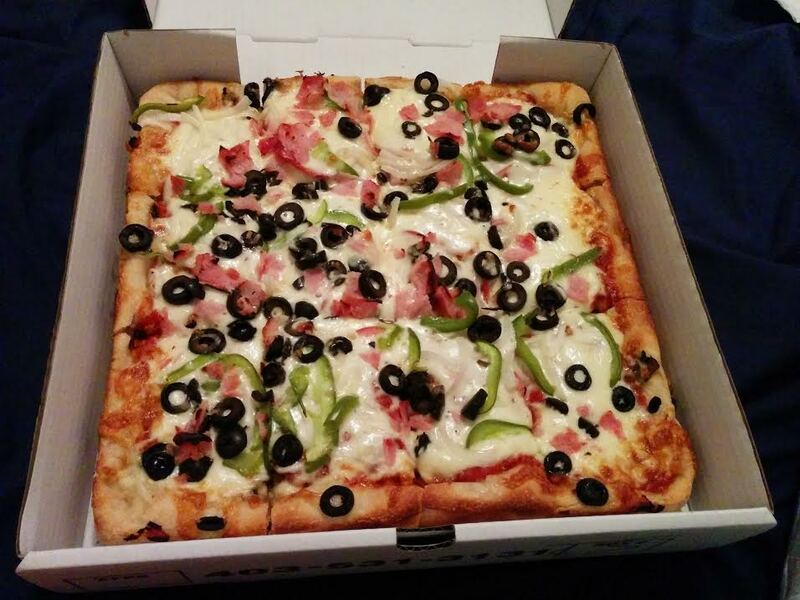 It’s got a crunchy, cracker thin crust topped with an abundance of fresh toppings. 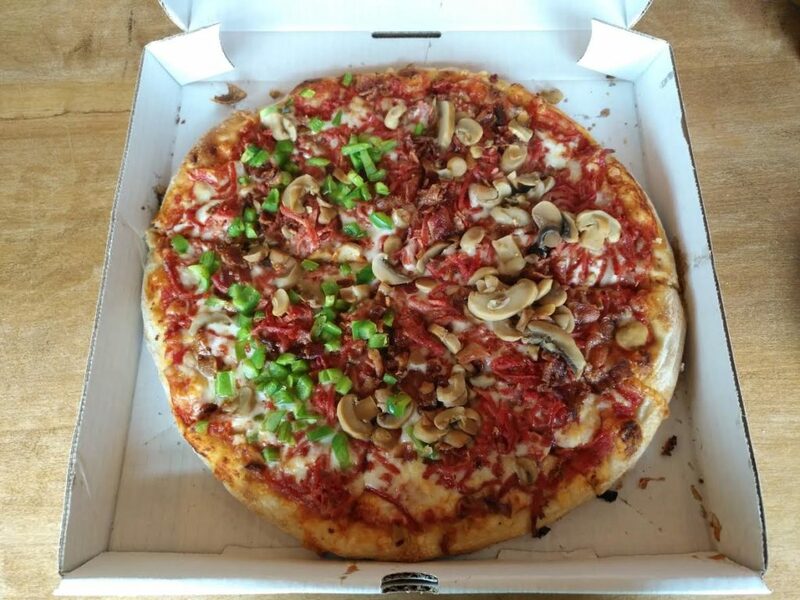 As you can see, ALL the toppings go on top, no matter how absurd. Tom’s House of Pizza is always attached to a divey lounge of some sort where you can order a beer and watch the game. I have fond memories of eating this pizza at Adventurer’s Pub after a night at the roller disco (R.I.P. Lloyd’s!). There’s also Pizza Bob’s Classic Pie, which used to be a Tom’s House of Pizza until Bob took it over and changed the name. Same style of pizza. No hard feelings(?). But like East Coasters, there are a fair number of Windsorites in Calgary, (thanks to the decline of the automotive industry). Just in my workplace alone I met 3 of them and they would talk endlessly about the pizza of their homeland. They would slam Calgary pizza, saying, “I could open up a shop and make better pizza than this Greek crap!” And one day in 2016, some Windsor folks did just that. 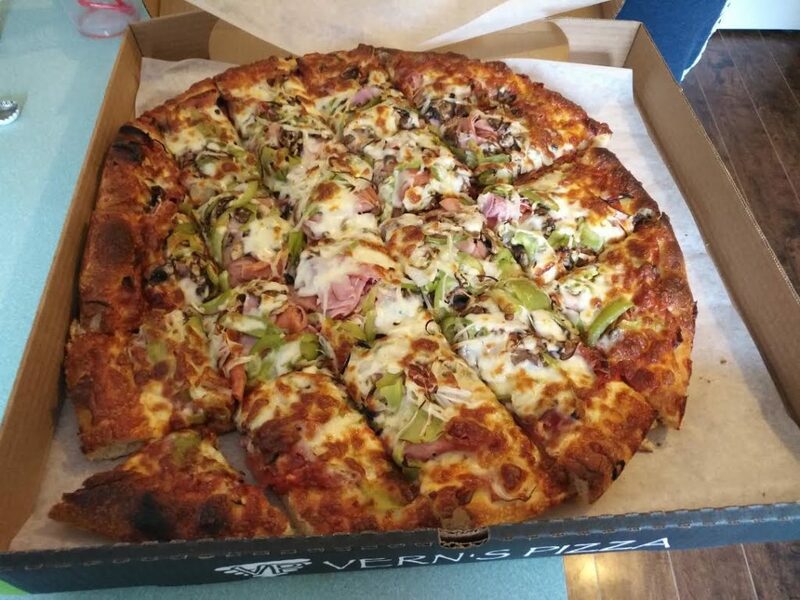 Windsor-style pizza is the antithesis of Calgary’s Greek-style. 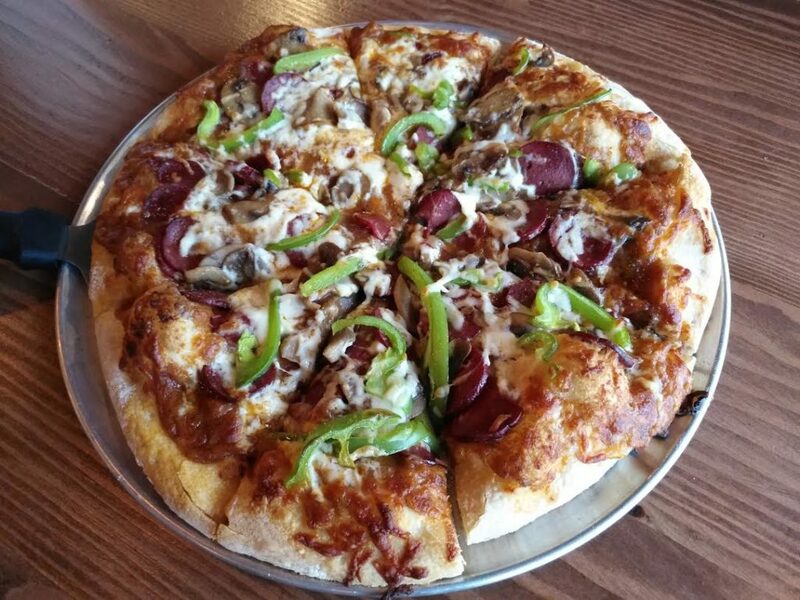 It’s got a medium-thick, hand-tossed crust that is cooked directly on the stone of a Baker’s Pride Oven. The toppings go on top of the cheese. The pepperoni is shredded. The mushrooms are canned. House-made barbecue sauces are the traditional accompaniment. We’re not in Kansas anymore! This is some seriously good pizza. Pair it with a Vernor’s Ginger Ale. Hold the Ranch dressing. There’s always been lots of Maritimers kicking around Calgary, and new businesses are increasingly catering to their culinary needs. The latest? Blowers & Grafton, named after Halifax’s famous “Pizza Corner”. 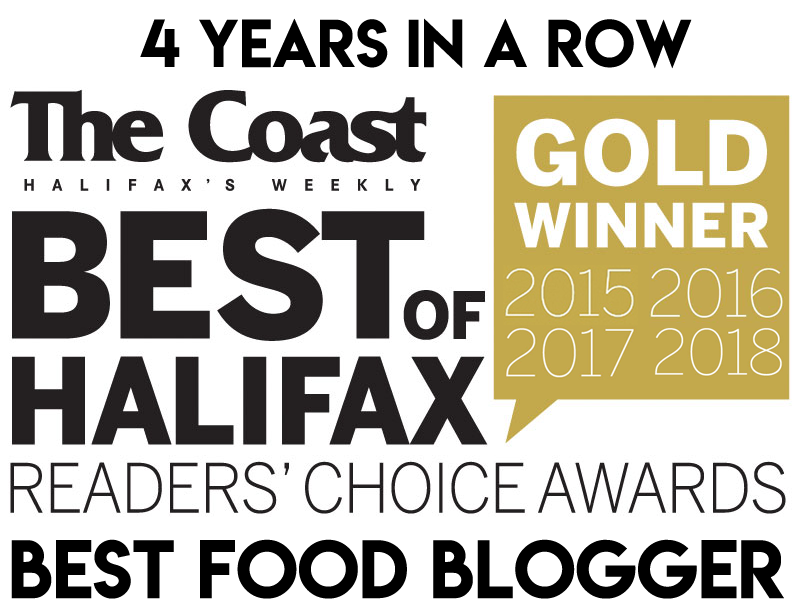 This trendy resto specializes in “Halifax Street Food”, like deep fried pepperoni and garlic fingers. They serve a legit donair and are probably the first restaurant outside of Nova Scotia to serve Pictou County Pizza, with its spicy brown sauce and Brothers pepperoni. 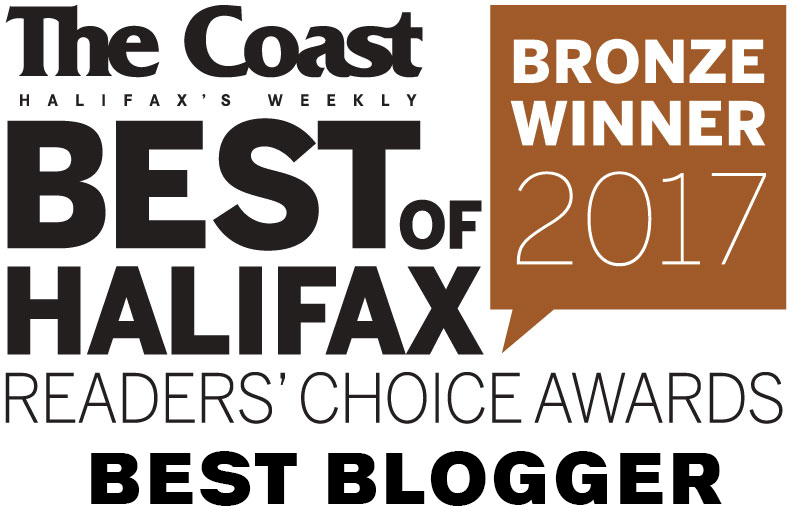 Pairs perfectly with a cup of donair sauce and an East Coast beer! A take-out in Marlborough slinging all your east coast favourites and lots of deep fried seafood. They’ve even got donair egg rolls! Originally owned by Newfoundlanders (who garnished their donairs with parsley, bless their souls!) this shop caters to the SW crowd who need their garlic finger fix! Una Pizza + Wine has been around since 2010, inspired by the California-style pies of San Francisco. Expect thin crust, chef-driven pizza with san marzano tomato sauce, hard-to-pronounce cheeses and meats and piles of arugula. You can enjoy it on their trendy 17th Ave patio, an excellent vantage for people watching. I really like the 4-maggi ($24), a four cheese pizza with provolone piccante, friulano, fior di latte mozzarella and pecorino romano, finished with truffle oil and local urban honey. This is quite rich and you will need that wine they’re talking about! Calgary also has several restaurants specializing in authentic Neapolitan pizzas. 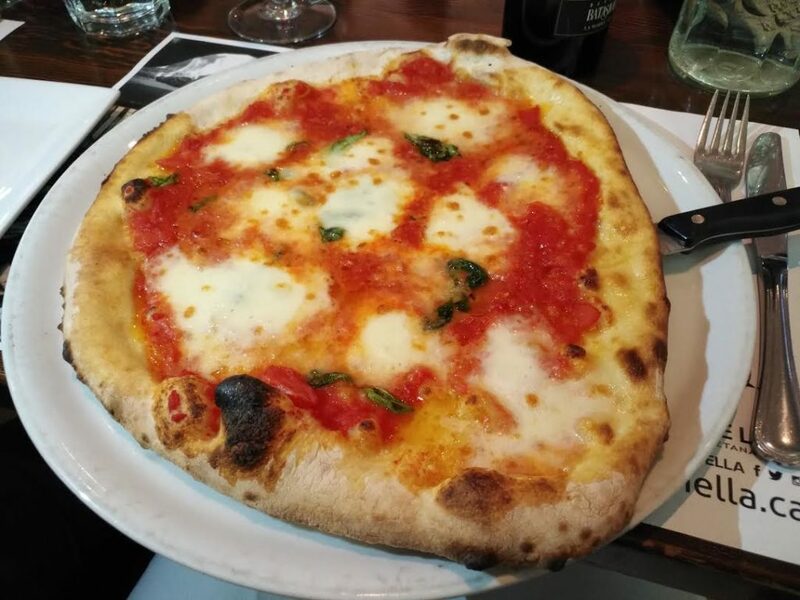 I had a fantastic margherita at Pulcinella last year that made it on my Best Meals of 2017! 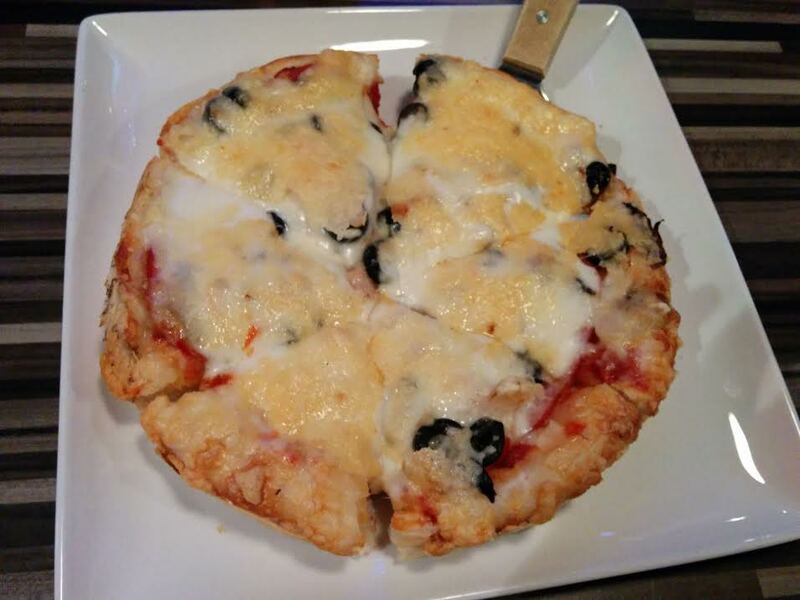 My Calgary blogger friend, Miss Foodie, insists you head straight to Azzurri Pizzeria! I’ll take her word for it, and head there on my next visit! Every time I visit Calgary I try to hit up some old favourites and try somewhere new. 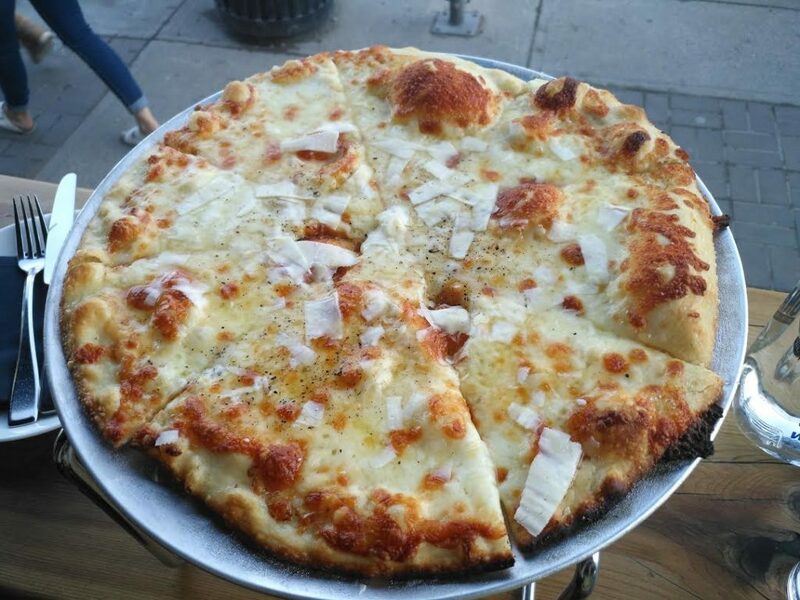 Where is your favourite pizza in Calgary? Where do you think I should go? Let me know in the comments or hit me up on Facebook or Twitter!